COVINGTON, Ky. -- First it was approved, then it was overturned. Now, the city of Covington is hurrying to finalize its plans for parking in one of its busiest neighborhoods, Mainstrasse Village, with a major construction project set to begin this spring. The future, at least in the short term, looks ... crowded. Covington City Commissioners reviewed earlier this month a proposed plan that would work to accommodate between 65 daytime parking spaces and more than 80 nighttime spaces lost during garage construction for the upcoming mixed-use development at 501 Main St., the entertainment district's entryway at the intersection of Fifth and Main streets. Parking: It's a topic that gets local politicians stumping, urban planners shuddering (or rolling their eyes), and neighbors pitted against neighbors in heated debate. Controversy surrounding proposed solutions to city parking is nothing new, but -- at least here in the Tri-State, it seems -- the most fireworks tend to fly over parking plans proposed for the region's urban bar districts, particularly the older, more historic ones. Throughout 2015 and into 2016, for example, Over-the-Rhine saw a similar back-and-forth over a proposed parking plan that , like Mainstrasse's, won Cincinnati City Council's approval before Mayor John Cranley quickly vetoed it . Who's sick of talking about parking? For local musician Kyle Knapp, living in an entertainment district like Mainstrasse -- where he frequently plays at some of the neighborhood's most popular spots -- just made sense. "That's why I lived here," Knapp said. It's not uncommon to see Knapp walking down Main Street with his guitar strapped to his back, headed to play at one of the strip's live music venues. He said it's nice that he doesn't have to think much about parking when he's in his home neighborhood. Knapp lives in the heart of Mainstrasse, not far from Main Street. The home he shares with his wife and young daughter does not offer off-street parking, but he said he's lived in places that had the amenity. "It was probably worth about $20,000 of the asking price for the house," he said when asked if he misses off-street parking. "It was a three-deep driveway. Yes and no, I've been without it for so long." Having lived in the neighborhood for 12 years, Knapp has seen first hand how long the parking debate has gone on. "I've basically gotten a good view of both ways (between business patrons and employees, and residents)," Knapp said. "I lived here a while ago when we first got that taste of free parking, and I don't think we or anyone around us really found it to be an issue because we'd never had it before." Beyond the upcoming strain on the neighborhood's parking, Covington's newly elected mayor, Joe Meyer, convinced the City Commission to overturn a residential parking plan approved less than a year prior that protected parking spaces for those who lived in the area. That plan implemented permit-only parking along Bakewell, Philadelphia, Sixth and -- then later -- Seventh streets, as well as installed electronic kiosks for pay-by-plate parking along Main Street. Meyer said the impact was felt most strongly by business owners. "The effect of the parking plan was to decrease the number of people coming in to Mainstrasse and frequenting the businesses in the area," he said. "It was having a very dramatic impact on the bottom lines of the businesses." Resident Kelly Rose, who supported the parking plan, admitted the initial setup wasn't perfect. "While some streets received residential parking, others did not, which constantly moved the needle as to where non-residents and people who work in Mainstrasse could park," Rose told WCPO. Michael Zinga said his time working as bar manager at the Mainstrasse Village Pub, a popular spot particularly among neighborhood residents and regulars, has corroborated the mayor's claim that the parking plan was causing a slowdown in daytime business along Main. "It wasn't immediate, but within two months, we started down-turning, the daytime happy hour business for us, and for the rest of the bars, as well," he said. "The more we started talking to the regulars, the more we found out that the regulars had stopped coming here," Zinga said. He said the parking restrictions also posed new safety concerns for his staff, who regularly lock up shop and head to their cars as late as 4 or 4:30 a.m. With permits required for nearby parking, he said, sometimes that meant his employees had longer late-night walks back to their cars. "I didn't want to park in the big (Mainstrasse parking lot on Fifth Street) because I wouldn't leave here until 4:30 in the morning, and I didn't want to walk all the way there with money in my pocket just being by myself," he said. "There's only usually two of us that leave. So it was a little bit worrisome, and I would say everyone's tendencies tended to change as far as how they got here and parked." This collision of interests -- residents, businesses, and those businesses' patrons and employees -- serves as the soil out of which this debate has grown. Meyer said the lengthy back-and-forth between all parties concerned just adds fuel to the fire. "This has gone through a lengthy process of constant change, and at the end of the day all that did was add increased frustration and didn't really fix the problem," he said. Knapp said he feels worst for the people making a living in the neighborhood. "Honestly, a lot of the people who work at these places -- they might not live in Mainstrasse, but they still live in Covington, maybe just far enough away that they need to drive here," he said. "Say Bouquet for instance, they couldn't park in their lot. They'd have to park who knows how far away when the lot is right next door to them. I felt bad for them because they kind of view this place as a home for them, too, almost just as much as a resident does because they work here all the time." But for Rose, reverting back to square one leaves residents no relief, with even more strain in store once 501 Main construction begins. She said it makes her and other residents feel like an "afterthought." "As a resident who lives and patronizes businesses in Mainstrasse, it feels like the people who live in this community aren't really being heard," she said. "As parking becomes worse due to the new 501 construction, I am concerned what the parking situation will look like for the people who live in Mainstrasse." It's a similar tension that was seen in Over-the-Rhine nearly a year earlier, when Mayor John Cranley quickly overturned a council-approved residential parking plan for Cincinnati's burgeoning entertainment district, although Cranley framed it in terms of taxpayer dollars versus business traffic. "Cincinnati taxpayers from all neighborhoods paid for the public streets in OTR and, therefore, all Cincinnatians deserve an opportunity to park on the streets they paid to build and maintain. "There is no fairness in saying 'yes' to OTR but 'no' to Downtown or other neighborhoods," he said. The OTR plan -- which council attempted but failed to pass a second time -- would have set aside for residents 450 of OTR's 1,200 parking spots, with 150 "flex spots," which would have been free spaces for people who work in the neighborhood. Residential passes would have cost $108 per year. The mayoral veto was Cranley's first such action taken since entering office in 2013. Cincinnati's Pendleton and Clifton neighborhoods utilize residential parking plans. The dense grids and narrower streets in these older neighborhoods create the foundation for the logistical challenges involved in ensuring enough parking spaces are available. The fact that many of Mainstrasse's streets are two-way doesn't help. "Our fundamental strategy is to try to make sure we have a sufficient number of spots," Meyer said. In addition to on-street parking, Mainstrasse business patrons and residents can use multiple surface parking lots, most notably the public parking lot located on Fifth Street at Philadelphia Street. Thinking vertically is a critical part of mitigating parking congestion, particularly in the form of projects like 501 Main, that will eventually add parking capacity to the neighborhood. 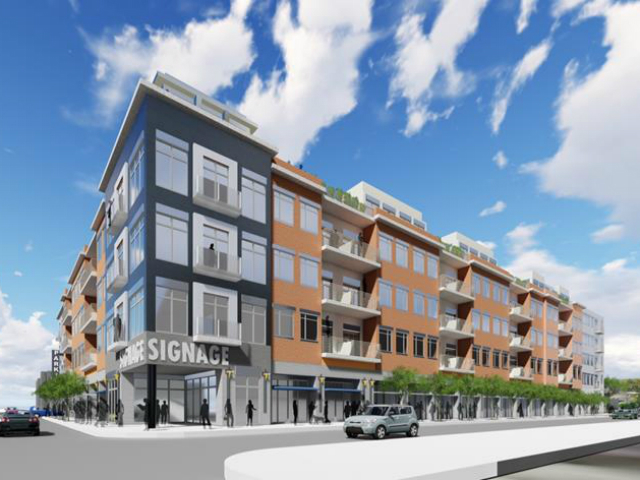 The development is slated to include a 314-space parking garage. Meyer said before a comprehensive parking plan could be approved, projects like 501 Main need to be given a chance to settle into the landscape. 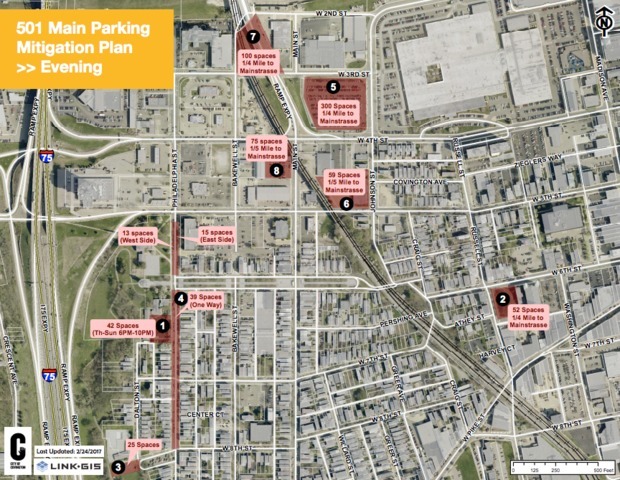 "Ultimately, I suspect that we'll have to come up with a comprehensive parking plan for the area, but we need to allow some of these developments to occur and for people to get used to the new arrangements before we come up with that," he told WCPO. Also in talks: D evelopers are looking at the nearby, historic John R. Green building and the adjacent property -- which also includes a surface parking lot -- as a location of interest. Plans are still preliminary for that site, and pending approval, but that development could include as many as 100 public parking spaces in a garage facility. It's a trend previewed, once again, in Over-the-Rhine, where the Mercer development created hundreds of new parking spots in the neighborhood. Mainstrasse is also experiencing rapid growth as far as its business community is concerned. Since 2014, eight new businesses have opened along the two-block strip, and another has re-opened. For Zinga, this makes the two-hour limit model problematic. "Sometimes a two-hour limit would be great, and sometimes a two-hour limit isn't enough," he said. "If I'm going to go to Commonwealth (Bistro)" -- one of the neighborhood's newest offerings -- "to have dinner, and go have some drinks after, two hours isn't enough. Am I supposed to move my car into another spot? "Great things are happening," he said. "It's exciting for this little, Strauss Haus-Village Pub-Zola thing, which is all we ever had before. It was just the kind of place to go get pub food and go have a beer. Now, you can actually dine and then go do something. Or go do something and then dine." Covington's City Commission has yet to approve a parking strategy to mitigate stress on the neighborhood's parking capacity during the 501 construction. Officials said they hope Mainstrasse's new parking garage at that location will open by December 2017, with demolition of the current building set to begin any time now. Construction of the garage will begin in June.